We want to expand on our April enews spotlight article that discussed a new way to share collaborative ideas and help generate excitement about preparedness using Public-Private Partnerships. Studies and polls continually show that most Americans are not prepared for disasters. According to the American Red Cross, a recent national survey revealed that only 7 percent of Americans have taken the recommended actions to prepare for disasters.  And a recent poll by Health Day reveals that 55 percent of Americans think they can rely on local authorities to come to their rescue when disaster strikes. But … as we wrote in our 9/9/2011 enews, the U.S. only has approximately 800,000 active Law Enforcement Officials (includes Police and Sheriff), 1.1 million Firefighters (over 70% are volunteers) and 210,000 EMT / paramedics. In other words, there are only about 2.1 million First Responders supporting over 300 million people..! So … how do we get people to pay attention and take steps to get themselves (and their loved ones) prepared? Utilize existing partnerships and relationships within your community and … pool money… raise money… and save money! And an innovative way to accomplish this is to use our collaborative tool and programs. 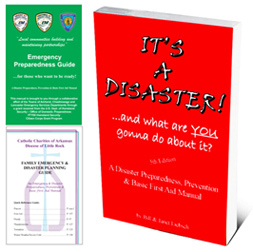 For 13 years we have called our disaster preparedness and basic first aid book a “tool” because that’s exactly what it is. It can help bring various players together within a community to help carry local safety messages, emergency data, plans and other information into local homes and businesses. Sometimes the hardest part is getting agencies, businesses, and groups to understand the simplicity and flexibility of this tool and all the benefits associated with collaborating on a book purchase ~ either using custom labels on/in our standard red books in small volume (any quantity) or in the print process on 1,000 books or more. And we deeply discount our 266-page publication up to 75% off (or as low as $3.50 US) and customize them for free since our goal is to get this data into as many homes and businesses as possible. But now that agencies, businesses, nonprofits, volunteer groups and families are all cutting budgets and expenses due to the tough economy, everyone needs to think creatively and “outside the box” more. To help explain this collaborative book project, we’ve developed a brief overview (also describing below) in case these ideas can help your agency, school, organization and community. Public and private sectors can collaborate on this creative public education campaign and pool various buckets of money together to purchase ANY quantity of custom books with ANY combination of funds including grants, seed money, Sponsorship revenues or Fundraiser orders (esp. schools and youth groups who take advance prepaid orders using Fedhealth’s traditional fundraiser). And we can individually receipt each amount to keep everyone’s records clean. Ask local public and private sector partners to place sponsorship or safety messages, ads, coupon or QR codes and more inside books so citizens can get valuable information and discounts on all kinds of products and services ~ locally and nationally. Collect whatever you can get too — cash, lines of credit or barter / trade — and keep it all since we customize books for FREE! Plus part or all sponsorship and ad revenues (and fundraiser pre-sales) can be used to purchase more books so groups can continue the cycle and grow year after year! Another benefit is the project can provide about a $4-to-$1 (or more) return on match that agencies, nonprofits or communities can use on matching grants programs. And an idea to help disseminate books is have your local CERT (or other volunteer group, civic club, etc.) coordinate with schools or Scouts who can sell the finished customized (and paid for) books to the community as a fundraiser. It’s a fun way to get youth involved in preparedness campaigns and get lifesaving data distributed out to the community … PLUS funds help the kids and volunteers..! Custom books that include lots of discounts and savings on products and services can help generate buzz and excitement about preparedness across your community. And residents will look forward to new versions of the book containing more savings in future projects. Agencies, VOADs, volunteer and youth groups [CERTs, MRCs, Scouts, etc. ], K-12 schools, civic clubs, faith-based organizations and others can do similar projects using grant or seed money, sponsorship dollars, ad revenues, fundraiser orders or any combination of these things to continue the cycle and grow as more local and national partners join in each year! And remember… many groups start out small and add in more and more partners as the word spreads. And we can be available for conference calls if presenting ideas to community groups (even off hours and on weekends) and have nonprofit contacts that can assist in organizing and coordinating projects on a contractual basis, if needed. This innovative custom book project can help build partnerships between the public and private sectors … fund volunteers, schools and First Responders … provide tons of resources and match for groups … and educate local communities while saving them money on preparedness supplies and services! It’s a whole community approach to resilience that can expand every year! Please visit our Public-Private Partnership page for more information or call 1-888-999-4325 and let us know what we can do to help your communities become more prepared. The recent attacks at our nation’s Embassies in Egypt, Libya and Yemen and the continuing (and planned) demonstrations across the Middle East may make many Americans reconsider traveling abroad during these violent times. But if you do plan to travel out of the country for business or pleasure, consider visiting the US State Department’s Travel site for information about travel alerts, international travel resources and tips, passport and visa information and more. And obviously as of September 12, 2012, the Department of State warns U.S. Citizens against all travel to Libya. Also on 9/12 the Department of State ordered the departure of all non-emergency U.S. government personnel from Libya, following the attack on the U.S. Diplomatic mission in Benghazi. The political violence has increased in both Benghazi and Tripoli. The airports in Benghazi and Tripoli are open and U.S. citizens are encouraged to depart by commercial air. The Bureau of Consular Affairs’ STEP (formerly known as “Travel Registration” or “Registration with Embassies”) allows you to receive the latest travel updates and information, plus authorities will be able to assist you better in the case of an emergency. Over the years, consular officers in embassies and consulates around the world have assisted thousands of U.S. citizens overseas who have lost passports, had their passports stolen, experienced health problems, been detained, dealt with natural disasters like hurricanes and earthquakes, and other emergencies. If you register your travel plans through the Smart Traveler Enrollment Program it will help the Department contact you if there is a family emergency in the U.S., or if there is a crisis where you are traveling. In accordance with the Privacy Act, information on your welfare and whereabouts will not be released to others without your express authorization. Make sure you have a signed, valid passport, and a visa, if required, and fill in the emergency information page of your passport. To avoid being a target of crime, do not wear conspicuous clothing or jewelry and do not carry excessive amounts of money. Also, do not leave unattended luggage in public areas and do not accept packages from strangers. Contact the State Department in an emergency. Consular personnel at U.S. Embassies and Consulates abroad and in the U.S. are available 24 hours a day, 7 days a week, to provide emergency assistance to U.S. citizens. Contact information for U.S. Embassies and Consulates appears on the Bureau of Consular Affairs website at http://travel.state.gov. Also note that the Office of Overseas Citizen Services in the State Department’s Bureau of Consular Affairs may be reached for assistance with emergencies at 1-888-407-4747, if calling from the U.S. or Canada, or 202-501-4444, if calling from overseas. Learn more at http://travel.state.gov or on Facebook at https://www.facebook.com/travelgov or Twitter at https://twitter.com/TravelGov . Another good site to review prior to traveling abroad is the Center for Disease Control travel site at www.cdc.gov/travel to obtain health information and alerts, resources and travel notices. Also download some free tips and information about earthquakes, hurricanes and other topics from our IT’S A DISASTER! book here and stay safe! The ninth annual National Preparedness Month kicks off today September 1, 2012 with a “Pledge to Prepare” theme. The NPM campaign, sponsored by FEMA, Ready and Citizen Corps, seeks to transform awareness into action by encouraging American families and businesses to take the necessary steps to ensure that their homes, workplaces and communities are prepared for disasters and emergencies of all kinds. As a proud Coalition member once again, Fedhealth is encouraging everyone to take the pledge, join the team and help themselves, their neighbors, and their communities be Ready. 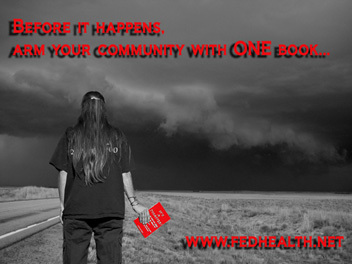 Spread preparedness messages As we do year-round, FedHealth will be sharing preparedness and safety information in our e-news and on various blogs and forums we contribute to; appearing on multiple podcasts; discounting our products while helping fund volunteer groups, nonprofits, schools and others … and much more! Creative Public-Private Partnership programs Our collaborative Public-Private Partnership ideas can generate buzz and excitement by partnering with public and private sectors + help fund First Responders, volunteers and schools + educate local communities = a whole community approach! Learn more about our revenue sharing ideas. Proud sponsor of HSFA’s Ready Roadmap San Diego The Homeland Security Foundation of America is planning to kickoff Ready Roadmap San Diego from Paradise Point Resort (“HALO Island”) this fall, sponsored by the HALO Corporation and Fedhealth. You are currently browsing the Fedhealth blog blog archives for September, 2012.